Mike Hood pours molten bronze for the final time of his 43-year career. On December 20, 61-year-old Mike Hood poured his last ladle of 1,800-degree molten bronze to create rudders and other parts for the marine industry at Union Foundry in Bellingham, Wash. The foundry had been the livelihood for the Hood family for 116 years. “We have one more pot, so I’ll be handling the ladle for the last time,” Hood told Trade Only Today, a few days before Christmas. Smaller profit margins created a need for more volume, said Hood, and he and his his two-person crew couldn’t keep up. There was also the issue of foreign competition breathing down the neck of the family business for the last 30 years. “I knew it was going to die with me because I didn’t have anybody following in my footsteps,” Hood said. The other two Union Foundry employees have been with Hood for 23 and 20 years, respectively, so there was no up-and-coming youngster looking to take over the business. Hood has two adult daughters who chose other careers. There seemed to be little choice after 43 years of working in the foundry except to close the business. 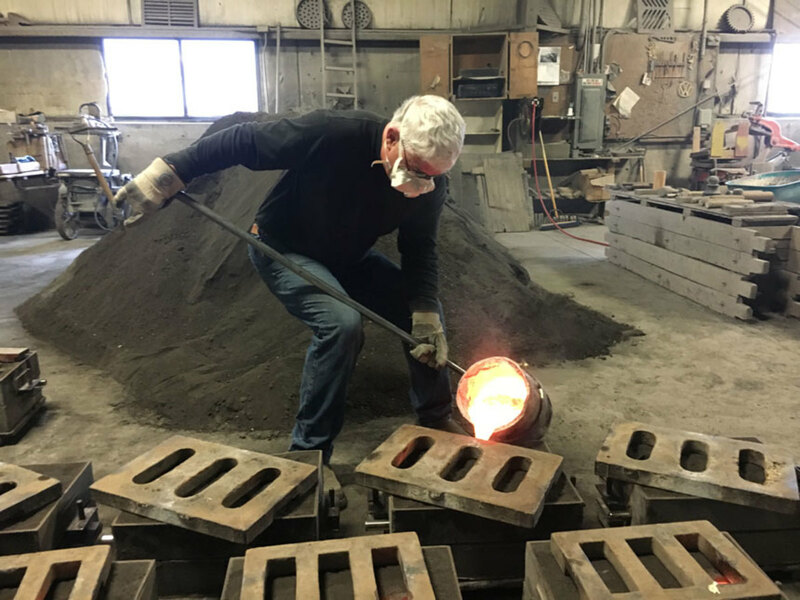 “We seem to have attracted a lot of characters over the years and just remembering some of that was great,” said Hood, who became a fourth-generation family member who started working at the foundry when he was 14. At 18, fresh out of high school, he worked full-time. Hood with some of the products his company makes for the marine industry. 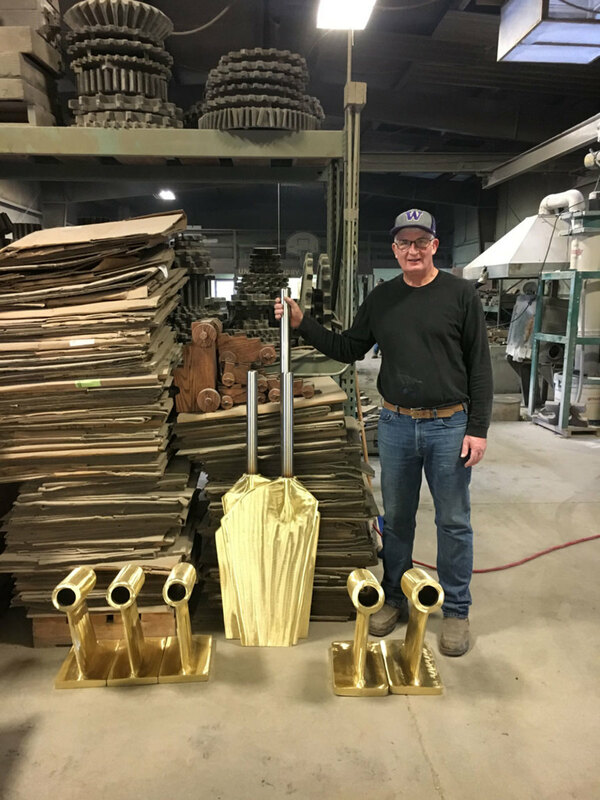 For the past few years, Union Foundry has been making rudders, shaft struts and other hardware for a marine-parts distributor, Marine Hardware in Redmond, Wash. “We were fortunate to get hooked up with them and have them distribute our work,” said Hood. In the early days, the foundry worked with cast-iron, making sprockets and gears for local lumber mills as well as catch basins and manhole covers for the city of Bellingham. That lasted until the municipality started to import those products in the 1970s and 1980s. When his father Jim Hood passed away in 1998, Hood took over the business. The company has been in the same location since 1906. Hood said he worked in the old foundry for a year before it was torn down and replaced with newer one. Hood said that he enjoyed all the aspects of the labor-intensive work, from making the molds to manually pouring the molten bronze from the 4-ft.-long, 80-pound ladle into them. Plus, there was an added benefit. “I never felt like I needed to go to the gym after a day working here,” he said.